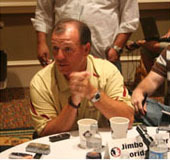 Florida State football coach Jimbo Fisher talks with the news media in advance of his team’s game on Saturday with Virginia. Pretty good defense you’re facing this week? Why are they so good defensively? Coach Groh isn’t there anymore, but when he was he emphasized defense. Are they any different now? Your first road game didn’t go very well. Will you change anything this time around? What they big differences from a coach’s perspective going on the road as to playing at home? What is the update on the left tackle situation? What is the biggest difference with our defense this year compared to last season? Can you talk about Brandon Jenkins development? He is no longer just a speed guy is he? Mike Harris seems to have great instincts too?